Congrats, Mark - looks like you've got a genuine pattern piece! Would be great to read Joseph Payne's eventual detailed verdict. I will certainly be posting the reply I get to keep you guys informed!! Once you get a definitive answer, your basic choices are to sell it or to keep it. If you want to keep it, I would recommend that you buy some other Jersey 50p pieces to show the difference. The problem is then how to keep them. Don't wrap them in just anything. Many materials will end up damaging your coin, including older plastic coin bags, paper, young wood and cotton wool. Good stuff includes coin cartons, hard plastic coin boxes and metallic coin suitcases. If you want to sell the piece, don't have dramatic expectations and you won't be disappointed. If only a handful are known, that sounds great, but demand for patterns is quite small. If you happen to find a collector who wants it, you will be pleased with the price, but the item may also remain unsold for some time. Your best bet is probably a well established auction house (not an online auction!) There are none I know of in Jersey, but plenty in London. My first choice would be Spink, but there are many others. When selecting an auction house, compare two variables: are they likely to reach the people who collect this sort of pattern (basically British and especially Jersey collectors) and what do they charge. You can negotiate the auction fee with some houses if you have particularly good stuff. It helps if the house is willing to write up the coin: put a few paragraphs with background information in the auction catalogue. Thanks very much for your advice Peter! Does anyone know what happened to this coin? I'm looking for any and all rare 50ps, partly for research and partly to have the opportunity to make an offer. The latter is not essential if the owner doesn't want to sell. Mark hasn't been around since January 2013. Your best bet is likely a PM. My guess is that this coin was produced as a trial piece for the amended reverse designs omitting the word "new". Jersey had, by this point, only issued coins dated 1968 (5p, 10p), 1969 (50p), 1971 (1/2p, 1p, 2p) and 1975 (2p, 10p). 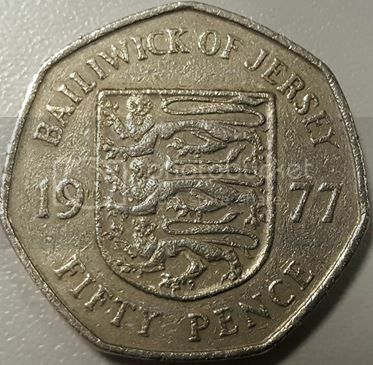 Guernsey had removed the word "new" from their coins in 1977 and it's likely that Jersey were looking to follow suit. However, they had enough supplies of the earlier-issued coins (1968 to 1975) to last them a few more years. By the time they required new coins, in 1980, the Royal Mint presumably hadn't got the new dies ready and were not in a position to strike the amended reverse designs. In need of coins, the original reverse style, still with "new", were produced instead. As the Royal Mint hadn't fulfilled the agreement, they produced further coins dated 1981, this time with the amended reverse designs that mimicked the 1977 trial pieces. As masses of coins dated 1980 had been produced, only 50,000 of each of the 1981 coins were required (a small issue even by Jersey's standards). That's purely my speculation. I could be completely wrong! I now have this coin in my possession! Still need the paperwork from Mark but I should hope that will come over..
@beeston: congratulations. Please take good care of it. @Alan: what strikes me is that this coin has obviously circulated. Yet, it is extremely hard to find. That points at an escapee from re-melted (rejected?) issue, rather than a trial piece. I was very surprised when I came across your FB post! Congratulations, Beeston. I won't ask how much you paid for it! Not quite sure what the last one means. 140 tons??? That's a bit heavy for a coin. Presumably the 5.7.2002 date was the date the coin was returned to the Royal Mint? Are we surmising then that the coin that Mark had (and now no longer does!) somehow got sent to Jersey (perhaps in amongst the 1980 issue or even the 1981, with it being the same type)? It circulated for at least 16 years and no one noticed, then called in in 1998 after the 1997 reduced size issue. I contacted Mark last night about something else, so I took the opportunity to mention this coin. 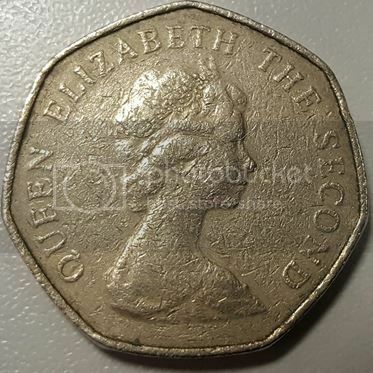 Apparently he found it in a laundrette in 2002, as the laundrette hadn't yet converted its slot machines and was still using the old size 50p coins. This was four years after the coins were officially withdrawn. I'm guessing that the 2002 one in the Royal Mint's list was discovered in amongst the coins returned from Jersey to the Royal Mint to be melted down and recycled. It makes me wonder how many other 1977 50p's escaped and ended up melted down without anyone realising!